The Scheme of Setting up of 20 new IIITs in Public Private Partnership (IIIT PPP) was proposed by the former UPA, (United Progressive Alliance) Government and it was approved by the Union Cabinet on 7.12.2010. But it does not have provision to empower the Institutes set up in Public Private Partnership to grant degrees to its students. The first batch of under-graduate students enrolled in the Year 2013-14 will be passing out in the current academic year 2017.
i. 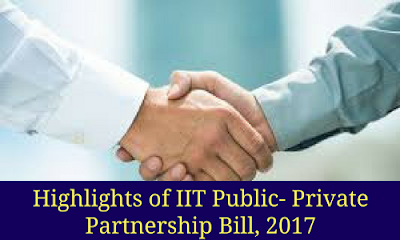 Introduction of the Indian Institutes of Information Technology Public Private Partnership (IIIT PPP) Bill, 2017.
ii. To grant statutory status to the fifteen Indian Institutes of Information Technology (IITs)in Public Private Partnership and declare them as Institutions of National Importance(INI). iii. To enable these institutions to grant degrees to their respective students in the academic courses conducted by them. There is no financial implication regarding to the proposed IIIT PPP Bill, 2017. The bill was cleared by the Lok Sabha on July 19, 2017 by the process of voice vote. The eminent academic institutions of our country like AIIMS, JIPMER, IITs, IIMs have been provided the status of 'Institutions of National Importance' by the Government of India. This Bill will declare the existing Indian Institutes of Information Technology in Public Private Partnership also as 'Institutions of National Importance' with powers to award their own degrees. This will entitle those institutions to use the nomenclature of Bachelor of Technology (B.Tech) or Master of Technology (M.Tech) or Ph.D degree as issued by a University or Institution of National Importance. The grant of a formal degree in Information Technology, other fields of Engineering or Ph.D will enhance the career prospects of the graduating students in the job market. It will also enable the Institutes to attract enough students required to develop a strong research base in the country in the field of technology. The emerging needs of the industries and the economic organisations, for skilled technical manpower is expected to be met from the talent pool of trained personnel of these academic institutions. The cabinet also assured that every Institute shall be open to all - irrespective of gender, caste, creed, disability, and domicile, and ethnicity, social or economic background. The Government is taking several measures to balance the gender gap, which includes setting up of a committee to increase the number of female students to get admission in Indian Institutes of Technology.